AMMAN, JORDAN, Sept 7, 2017 - (ACN Newswire) - Executive Telecom (ETC) is pleased to announce that they have signed a partnership agreement with MobiCash across the Middle East on August 31, 2017. The first services ETC and MobiCash will bring to the region begin in Jordan this month as part of JoMoPay, the Central Bank of Jordan's vision for mobile payments in Jordan. MobiCash offers a suite of mobile payment solutions that are crucial to expanding JoMoPay functionality and reach across Jordan. Services to be launched in September 2017 will include One Time Pin (OTP), bus payments, hospital and clinic payments integrated into medical systems, smart government payments and mobile payments in taxis. ETC works with Payment Service Providers (PSP's), government ministries, and merchants, to deliver mobile payments. Khaldoun F. Bazzari, ETC President and Founder, commented, "We are delighted to have MobiCash as our partner. We are delivering today on JoMoPay's vision for financial inclusion and electronic payments for everyone in Jordan using the device we all hold in our hand, our mobile phone." 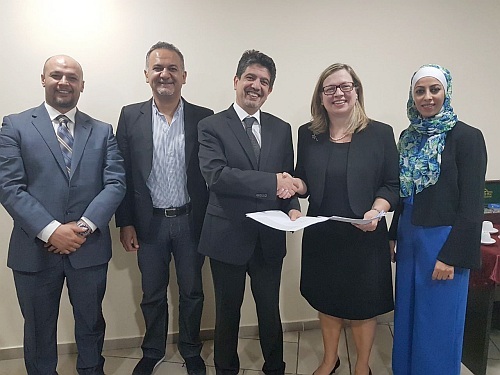 Ann Camarillo, MobiCash Global CEO, added, "It is an honor to work with ETC and bring our solutions to the region starting in Jordan. We have been very impressed with the work the Central Bank of Jordan has done to create and launch JoMoPay and their vision for financial inclusion." ETC, formerly known as Boloro Jordan, ended their partnership with Boloro Global on the 28th of August 2017, to focus on working with Mobicash and deliver comprehensive and timely solutions to JoMoPay in Jordan. For more about ETC, contact Lina Al Nojum at lina.alnojum@ezpayint.com. For more about MobiCash www.mobicashonline.com. Lina Al Nojum, ETC Managing Director, Ann Camarillo, President MobiCash Global, Khaldoun Bazzari, President and Founder ETC, Tamer Bazzari, Financial Adviser & Board Member, Ahmed Kisswani, technical manager (R-L).